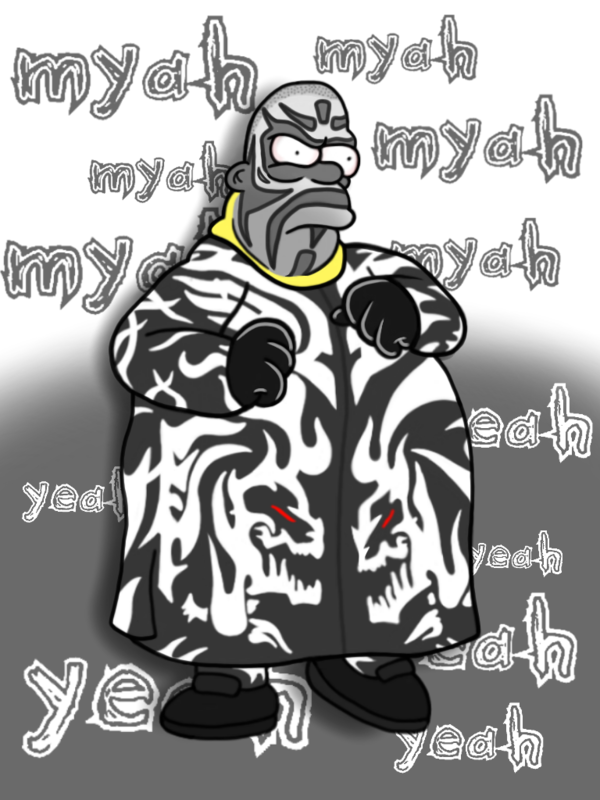 Hope you enjoyed TNA LOCKDOWN over the weekend! I figured it’s a great time to give a general update! Of course includes sending out what bars, liaising with artists/answering emails/FB/twitter etc. May/part of June, I felt I hadn’t released exclusive NoggerU content in months and I owed them something so I spent that time releasing 3 NU vids! I don’t think Jan-June looks too shabby but I can see that if you’re only interested in old PPV reviews then it was a long wait between Dest X and Lockdown. This is pretty important, I’ve officially added other projects to the schedule! Namely my videogame radio show (Super OSW 64) and NoggerU film reviews. Doing these smaller projects keeps me sane and I enjoy doing them. I burnt out late last year only working on OSW episodes pretty much exclusively, and getting one out per month was a nightmare – I was knackered and miserable in general. I usually work so hard I have to take a few days off thanks to throbbing migraines. Same with Destination X, I edited 10 days straight to finish it after midnight on a Sunday before a Tuesday morning flight to Orlando, having not had time to pack. I can’t work 7 day weeks anymore and I need some stability and routine in my life. Me editing the 2017 rimble. this is actually a less complicated than a classic review! You’ll notice a modern WWE review is in there – I enjoy touching base with WWE semi-regularly, and I think we do a really good job with what we’re given! I’m going to do what I’ve always done, and that’s whatever makes me happy and inspires me creatively. It’s the only way to keep the quality as high as it can be 🙂 If you’re reading this then I’ve done a good job so far! 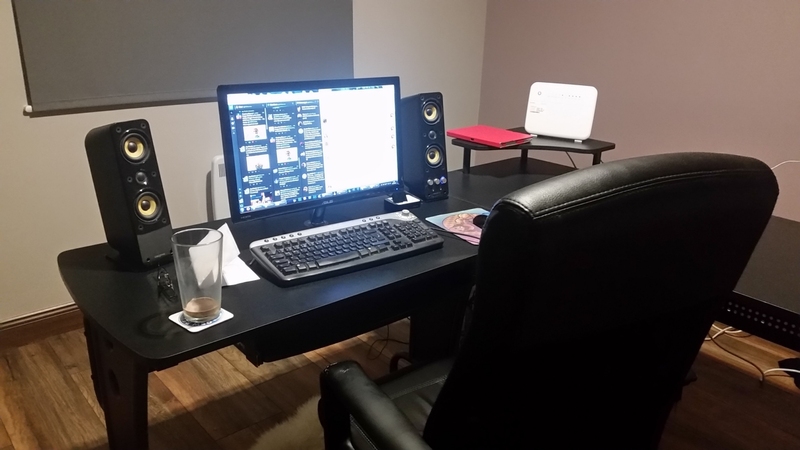 My new editing room! With my 15 year old keyboard. Also, chocolate milk is amazing! • I moved to the countryside so I have a place to edit! I was sleeping, living, eating, editing and relaxing all in one room, and I was climbing up the walls! Thankfully since early June I’ve all set up. I wasn’t prepared for how difficult it is to move into a new apartment and kit it out so it’s more of a home. V1 moved house too, he’s been having an awful time too! lol. Recommend not moving if you can avoid it. • V1 joining the production side starts from scratch. We’ve purchased an editing/gaming rig and we’re still waiting for bits and bobs to come in. After that we put it together and I teach him to edit in a way that cuts down my production time. This will take a few months and I’ll start him on some smaller editing projects. • The managerial role in OSW takes up a lot of time (i.e. going back and forth with artists/animators/musicians). For example, the Zojack Yesman video took a combined 100 hours to get done, which is the same as editing an OSW episode itself! I love doing it and I think the finished product is awesome but it does eat into editing time. I think these ‘flourishes’ make OSW feel extra special, more of a show and less of a straight review. I’m finding it difficult to balance the two but there’s no quicker way – I don’t know if anyone can help me with it, because it’s a creative thing coming from my noodle! • I should explain that I’m the bottle-neck with OSW. Outside of music, artwork and custom animation, I’ve edited the past 64 episodes by myself. I’m very particular and meticulous with every inch of the show. I’m trying my best to allow myself to slowly release the reins with the “donkey work”, so I can simultaneously work on a different part of the show. • Prep audio (eliminate audio leak from individual mic recordings), mix and levelate. • Edit Video Side A. Side B. • +/- create M3 -> Release! The only part here that I’m comfortable about letting someone else do atm is video editing Side A & B. So that’s what I’ll have V1 do, as I start work on the splicey. All the other stuff contains creative decisions that I have to make, so (hopefully) when you’re watching OSW, it feels distinctly like OSW. 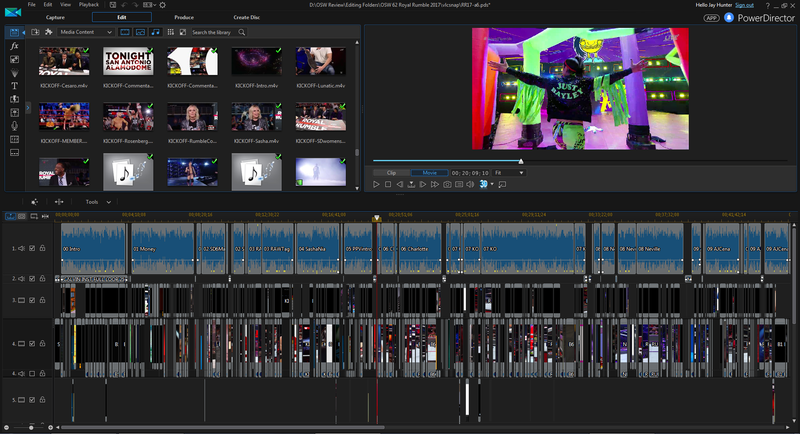 By the way, what did you think of the video editing of the NXT Orlando and WM33 videos? I didn’t have a hand in video editing them (only the audio). That’s what it would be like if someone else edited the video. I’m more comfortable to loosen the reins for NU film reviews as they’re more straight forward, so collaborating with freelance editors is an option to cut 30-40% of the production time. I still do the audio and 2nd and 3rd passes. I was really happy with the Alien review; I was able to work with Chris to build off the original cut! Anyway, that’s loads to take in. What’s the future for OSW? I’ve massive, scary ideas for the future (in the best sense, lol), but for now my main project is getting V1 up to speed on editing so it both reduces turnaround time and gives me some more free time to work on other projects I’ve put off for literally years at this point. Please realise that OSW is an intensely difficult and creative endeavour, but that’s how I work and I love doing it, and I can’t do it all the time and nothing else. Creating different things make me happy, keeps the content fresh, avoids burnout and makes for the best episodes. My aim is to have an episode (new or old PPV) out roughly every 5-6 weeks (hopefully less of course), and getting a film review or radio show out every month. Sometimes I’ll need to work on NoggerU stuff to thank the people who are literally paying myself and V1 to keep doing what we do! When Steve is up and running he’s going to do videogame content, and has some massive, awesome ideas. The only thing I can guarantee is that I’ll work my hardest and I’ll give you my absolute best, every time. If you’ve any questions please ask below.